Recollecting Nemasket: What is Right? The following article was published in the Middleboro Gazette March 20, 1931, and was written by owner and editor Lorenzo Wood in response to the state's desire to clarify the spelling of "Assawompsett". What is the correct spelling of the largest body of fresh water in the state located in this town and Lakeville? That is what the Massachusetts Geographic Board is trying to learn and this week Selectman Albert A. Thomas received a letter from the board as to what he knew about the spelling of the name of the lake. It is found spelled seven times as "Assawompsett" on a map accompanying Weston's history of Middleboro; topographic sheet issued by the United States geological survey; Richards' Plymouth county atlas of 1903; James Parkhurst by his daughter, Helen Parkhurst of Lakeville; road map of the State Department of Public Works; annual report of the State Department of Public Health, 1928; report of committee on waterways, 1918. Three times the board has found it spelled "Assawampsett"; on a map on file in the State Archives Division made in 1794; also a map showing public water supplies in 1922; the text of Weston's history of Middleborough [sic]. 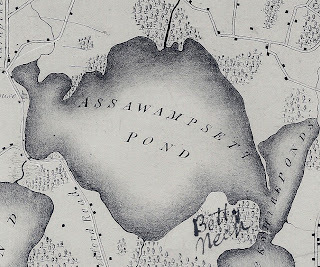 "Assawampset" is the spelling on an old state map of 1830. [Middleborough] Selectman Frederic Noble spelled it this way while Chester E. Weston in some of his reports spelled it "Assawompset", and Walling's county map of 1857 showed it as "Assowompset," while on a Walker atlas it is spelled "Assowompsett." This word in this locality has been used in various ways so you can take your choice. With the debate unresolved as to the proper spelling, Wood apparently was not up to considering whether Assawompsett was a pond or a lake. Historically, it has been known as both Lake Assawompsett and Assawompsett Pond. Assawompsett Court, located in the Heritage Hill subdivision in Lakeville, bears what is now the most common spelling of the lake. Map of Middleborough, Mass. Drawn by S. Bourne, 1831. Detail. The most common spelling in the 19th century eliminated the "O"s from the word. The largest boat ever to operate on the Nemasket River was named the "Assawampsett". Since its establishment nearly 100 years ago, Lakeville's elementary school has featured the more economical spelling with a single "T" at the end.